As seen on BBC One's Inside Out, talking about reluctant readers! LAST DATES FOR 2019 NOW BOOKING! This is just a short note to say a very sincere thank you for your time and energy last term. The kids were completely spellbound and are already looking forwards to next year! Thanks again for coming to our school and giving the children such a fun, interesting and inspiring day. The ones in homework club are still full of it! Thank you for inviting me to stay and have some time with you. I really enjoyed the vampire stories it made me laugh and also made my eyes water. I had lots of fun! We really enjoyed a very good time. Thank you for coming in. We all enjoyed listening and making up a story. Huge thanks to the ubercool author Tony Lee for spending a day with our Y7-9 lads encouraging them to read, read and read! Writer: Doctor Who, Horowitz Graphic Horror, Raven's Gate, Evil Star, Night Rise, Teen Reads, Bandits, Vladimir Tod, Spider Man, X-men, Battlestar Galactica, Outlaw: The Legend Of Robin Hood, Excalibur: The Legend Of King Arthur, Messenger: The Legend of Joan of Arc, Sherlock Holmes: The Baker Street Irregulars, Pride & Prejudice & Zombies: The Graphic Novel. BEFORE YOU CONTINUE... Please note, I'm not the 'usual' style of author talk. For a start, I don't bring any of my own books to sell. Which means (more importantly) that my books are *not* the sole content of my talks. I don't want to focus on *a* book, I want to focus on *all* books, and getting students to read them. And if you book my 'Change The Channel' tour, you gain four talks or workshops in a day to as many students as possible, as the more students that hear my talks or take my workshops = the more students that get something out of my my talks or workshops. In addition, I don't take questions and answers during a talk, filling the full hour instead - but I always ensure that I'm accessible to all students at breaks and during lunch, so they can ask me their questions in a more relaxed and quieter setting, where I can give the answers the respect they deserve. How a writer at my school inspired me to become one; however I had a problem with both reading and writing - books were just too long! I discuss problems with books and my impatience with reaching the end of them, showing how a book is a journey, not a destination. I also discuss the attitude of 'I read a book once, didn't like it, won't read another', comparing this to alternative media such as movies, showing how books can cover many topics. I also discuss comics and the help they gave me as a child. I discuss how reading comics got me reading adaptations of books which made me a better reader, and more interested in reading, comparing this rise in skill to playing games on a console, with comparisons to the 'defeating an end of level bad guy and progression of a game', or using sports like football, or even current fads like the recent loom bands, showing that doing something you enjoy isn't the same as homework. I discuss how I didn't know how to write, how I was scared of the 'blank page', and how I got over it by changing the rules of the game, showing how writing a story isn't homework. Using that cliffhanger scene, I get the children to tell me their story of what happened here. Often the children, when realising they can give any answers, will let their imaginations run riot. By asking the relevant questions, I lead them back to the start of the story, creating a continuous narrative from the suggestions that they give, showing that no matter how crazy it is, anything can become a story and that 'homework' isn't a dirty word. If I feel the group is older and more up to it, instead of getting them to tell me a story, I’ll bring four class members up and, using them as the ‘art’, explain to the audience how I create a comic, telling a story of great evil verses great good, working from a single moment, moving through the creation of characters and story, how to rewrite the tale to change the outcome, always working back to that original scene, with jokes and laughter throughout, building up to a twist climax. To end, for KS2 upwards I tell a five minute 'ghost' story that makes the kids jump, purely to show that when invested into a story, you can be taken anywhere as you read a book line by line, and never know what's going to happen next. The talk takes between 45 minutes to an hour, depending on time. It's loud and boisterous, and the children always give great feedback. In addition to these four talks, I also spend the whole day in the school, including (if you wish) lunch with a select group of children, usually either reluctant readers or a writing group, where I can give advice and suggestions in a more informal setting. I also provide a selection of workshops as well, ranging from lessons aimed at building spontaneity to working out what you would do if faced with a fantastical situation. These can be found in more detail on my website. If having me visit your school for the day is something that you may be interested in, then please email or phone me to discuss dates and rates. Please note that this isn't my day job, and as such I only put aside a few dates a month to do this, and often dates fill up fast. I am already taking bookings well into the 2018 / 2019 school year, and already have bookings during World Book Week 2019. Even though authors don't need CRB / DBS forms to attend school talks, I still have a basic disclosure CRB certificate available for viewing if required. A writer for over thirty years, I have worked in comics for many of those, working for a variety of publishers on licenses including X-Men, Spider Man, Teen Titans, She Hulk, Daredevil, Doctor Who, Star Trek, Superboy, Starship Troopers, Battlestar Galactica, Wallace & Gromit, Sherlock Holmes and Shrek! I have adapted into Graphic Novels a variety of books including Heather Brewer's VLADIMIR TOD range, Anthony Horowitz's HOROWITZ HORROR and RAVENS GATE series, Amanda Hocking's HOLLOWLAND and G.P Taylor's SHADOWMANCER and DOPPLEGANGER CHRONICLES. A multiple time Eagle Award nominee, I have also received critical acclaim for my creator owned work - my Graphic Novel OUTLAW: THE LEGEND OF ROBIN HOOD has been a Children's Choice Award nominee, an Eagle Award nominee, an American Library Association / New York Public Library Book for 2010 listing and a Junior Library Guild Selection for Fall 2009 among others and the sequel, EXCALIBUR: THE LEGEND OF KING ARTHUR was an American Library Association Book for 2012, and the third in the series, MESSENGER: THE LEGEND OF JOAN OF ARC was released in 2015 with the fourth, PIRATE QUEEN: THE LEGEND OF GRACE O'MALLEY out in 2019. My various DOCTOR WHO series have received 'best of the year' acclaims from both Ain't It Cool News and MTV as well as a record EIGHT NOMINATIONS at the 2010 Eagle Awards, and a 2012 Eagle Award win for 'Favourite Single Story'. In 2010 I adapted the best-selling book PRIDE & PREJUDICE & ZOMBIES into a graphic novel for Random House - this entered the New York Times Best-Seller Lists for Graphic Novels at #1, making me one of a select few British authors to do such a thing. In 2011 I wrote a series of four SHERLOCK HOLMES: THE BAKER STREET IRREGULARS graphic novels for Hachette Childrens Books / Franklin Watts, with acclaimed SHERLOCK HOLMES academic Leslie S. Klinger editing, DANGER ACADEMY for Kickstart Entertainment and both THE GLOOM and AGENT MOM for MTV Comics, the latter co-created and written with Alaina Huffman, best known for her roles on Stargate Universe and Supernatural. Added to this my book FROM THE PAGES OF BRAM STOKER'S 'DRACULA': HARKER was the first graphic novel sequel to DRACULA to ever gain any kind of endorsement from the Stoker Family. In 2018 I returned to Hachette / Franklin Watts to write a series of eight books in their 'Bandits' range for reluctant readers - including GRANDPA'S GOALSCARERS, MISTER CLIP CLOP - INTERGALACTIC SPACE UNICORN, TEACHER CREATURES, THE GREAT PET SHOP RESCUE, AGENT OF P.A.W.S, MY LITTLE BROTHER'S A ZOMBIE, SPACE CORPS and THE TIMELY ADVENTURES OF CAPTAIN CLOCK. For Badger Learning I have written several books for Reluctant Reader teens as part of their 'Dark Reads' and 'Teen Reads' ranges, including STALKER, JIGSAW LADY, MISTER SCRATCH, NOTICED, DOCTOR JEKYLL AND LITTLE MISS HYDE and OTIS, a modern retelling of Shakespeare's OTHELLO. Also for reluctant readers, I wrote GAMERHATE for Ransom Books. Recently I have moved into Film and TV with several projects including an episode of BBC One's DOCTORS that broadcast in May 2017. Ten Doctors. Ten stories. One ending. Fourteen-year-old twins Scott and Jamie Tyler have never known who they are or where they came from, but they have always known that they possess extraordinary powers. Go back to the beginning with these archive Tenth Doctor adventures! In 'Agent Provacateur', the search for the perfect milkshake tips the Doctor and Martha into a cosmic horror odyssey in the darkest reaches of space. And in 'The Forgotten', an amnesiac Doctor is forced to confront all his past selves! Ollie loves football, but his boots are worn out. So he uses his dead Grandpa's boots, and they magically fit. Suddenly, Ollie is playing better than ever, helped by his Grandpa's ghost! But Grandpa has a score to settle, and Ollie is caught right in the middle ... This title is part of the EDGE: Bandit Graphics series: individual, high-quality, safe, 32-page graphic novels written by New York Times bestselling author Tony Lee, suitable for readers aged 7+. Four books based on Anthony Horowitz's chilling stories. Heather Brewer's acclaimed Vampire series, adapted for Penguin Teen. 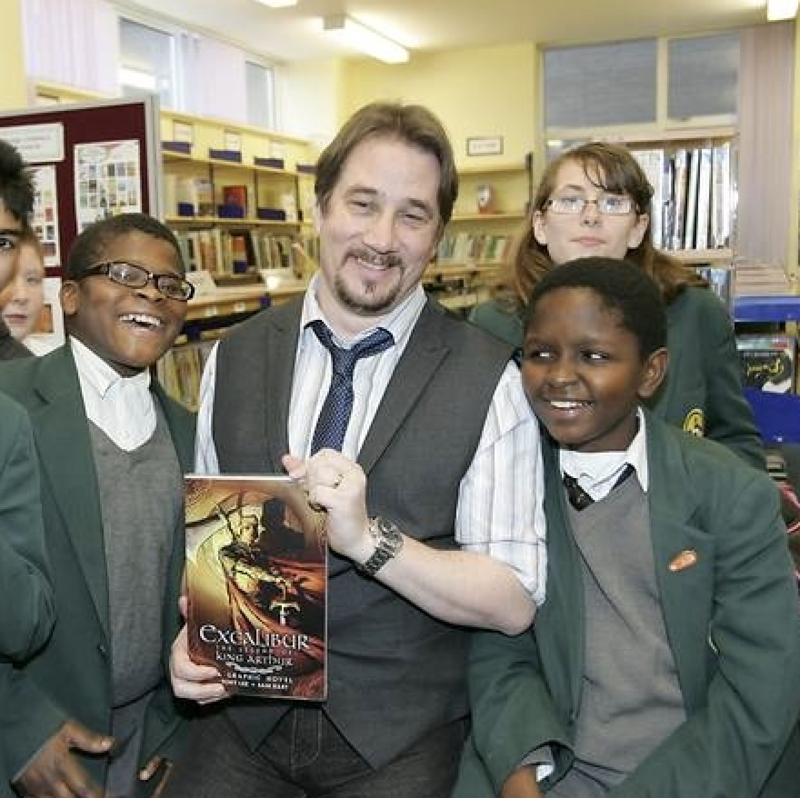 A series of 'in canon' books featuring Sherlock Holmes' young detectives. An adaptation of Anthony Horowitz's classic horror series. A retelling of the classing story. The #1 New York Times Best Selling List Graphic Novel.